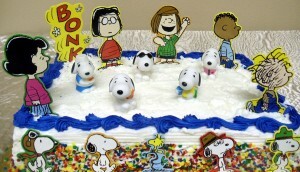 If you have a young child at home, sooner or later they are likely to want a Snoopy themed birthday party. Unfortunately, finding all the Snoopy birthday party supplies you want and need to make that birthday perfect is not exactly easy. So instead of offering a review, we thought it would be helpful to tell you where you can find various Snoopy birthday party supplies, so that your Snoopy themed party will be a huge success from start to finish. 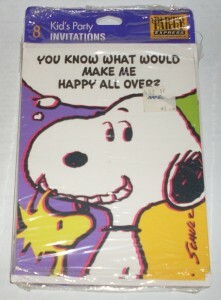 The Hallmark company offers a unique and fun filled Snoopy Party favor box. This box is the perfect thank you gift for all your child’s friends who attend the birthday party. Hallmark does keep open the possibility of substituting one item for another of like value if they are short of one of the items in the box. You can use the Snoopy party favor box as a party favor for each of your child’s guests, or you can purchase just one or two of these fun play kits to give as prizes for games. However you use the Snoopy favor box, kids will love all the small prizes inside. Manufactured by Hallmark and sold online by the Charlie Brown Store which has been owned and operated since 1971, these Snoopy themed birthday party invitations are perfect for that Snoopy or Peanuts themed birthday party. These invitation cards are older invitations so should be uniquely different from today’s invitation designs while still keeping with the Snoopy theme. 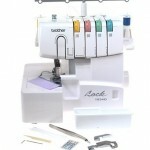 Party Explosion is a site that offers Party supplies, gifts, ribbons and wrap and balloons for kid’s birthday parties. The cute Snoopy party balloon set they offer is perfect to help make that Snoopy décor come alive. This brightly colored balloon set will add to your party decorations, and the 43” Snoopy balloon will be like having the famous beagle come to the party to help your child celebrate. Of course, no birthday party would be complete without your child’s favorite beverage served in those Snoopy themed party cups. 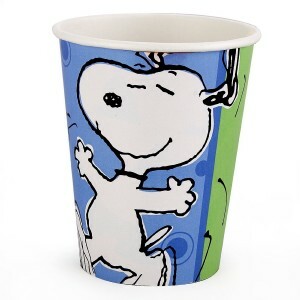 Birthday Express is a catalog and online retailer who carry a variety of birthday supplies, including those 9 fluid ounce Snoopy birthday cups. They are offering a set of 8 of these cups to help make your themed party a resounding success. The Adorable Peanuts Snoopy 16 Piece Birthday Cake Topper set will allow you to turn that plain frosted sheet or layer cake into a custom made Snoopy cake that will thrill your little one and help you create a birthday party to remember. The Peanuts Snoopy Birthday cake topper set is ideal for making that birthday cake the centerpiece of your child’s party, and there are enough cake decorations so that guests may be able to take home a cute little souvenir. Your child’s Snoopy themed birthday party is sure to be a success when you can find the party supplies you want and need to create the look and feel that you and your child envision.